Do your weekdays ever feel like a countdown? Some mornings, it’s as if my alarm is chirping, “Five days until Friday night!” “Four days left!” “Only three days to go!” It’s a mentality I’m trying to shake. Why spend nearly a week of potential living wishing it were a different day? Since I can’t make every day Saturday, I’ve found that squeezing in simple but scrumptious meals, like this easy Garlic Salmon with Lemon Butter, work magic on my weekday mood. This gorgeous, healthy salmon recipe is Saturday night special meets Monday night mayhem. It takes less than 10 minutes to prep, cooks on one sheet pan, and gives you a serving of lean protein and veggies in a single dish. Add a glass of wine and you have a meal that’s fit for high heels, all for a yoga-pants level of effort. For the record: I highly encourage that you eat this Garlic Salmon in said yoga pants. It is Monday night after all! 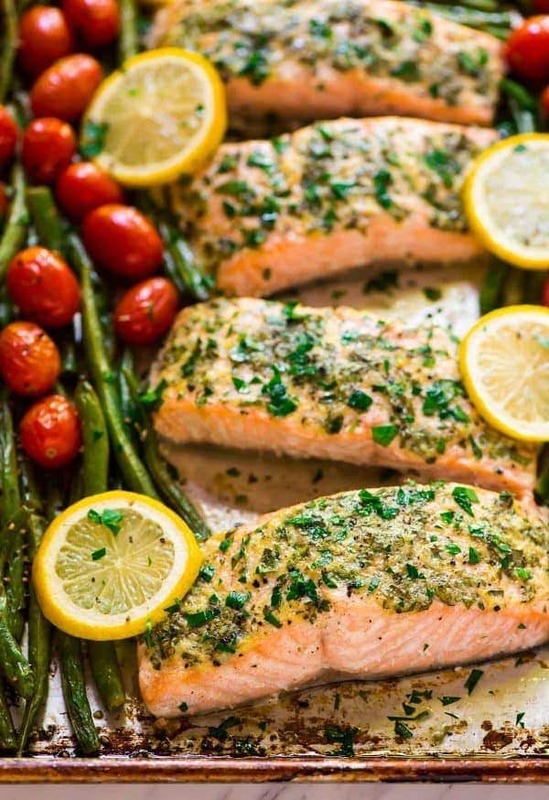 Garlic Salmon with Lemon Butter—Only 10 Ingredients! 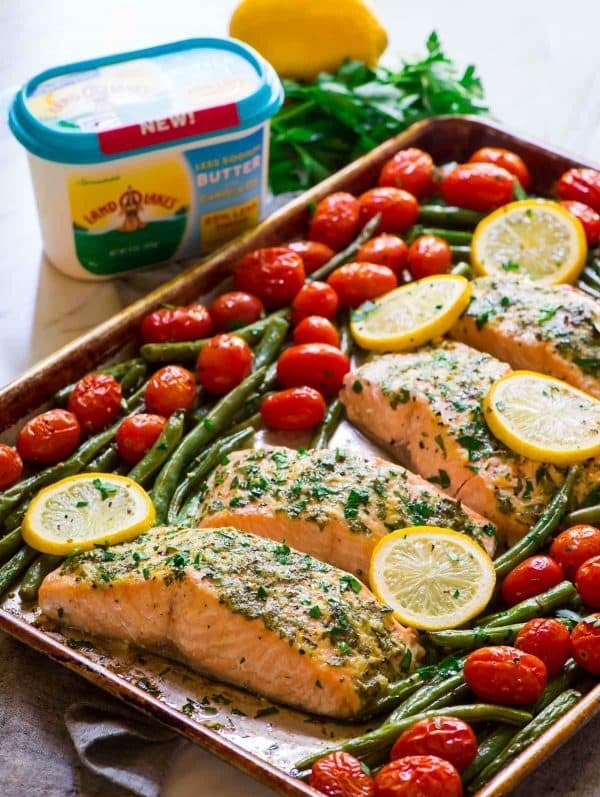 Doing double duty to make the baked salmon fillets ultra tasty and marvelously moist is a combo of fresh garlic and the latest addition to my refrigerator, Land O Lakes® Less Sodium Butter with Canola Oil. 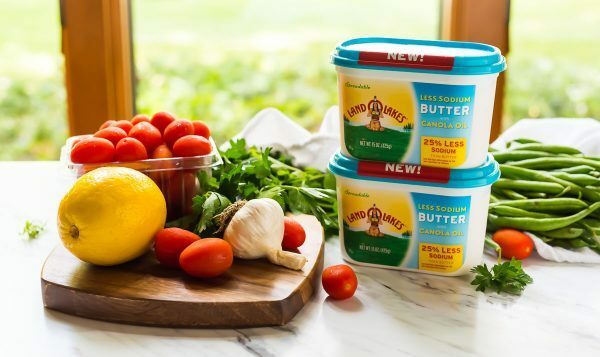 Land O Lakes Butter with Canola Oil tubs have been a staple in our household since I was a little girl slathering it on my dad’s pancakes. Back then, I cared only that it tasted buttery and delicious. Now, I also appreciate that it is made of ingredients that I can pronounce and is spreadable right out of the refrigerator. No waiting for butter = less waiting for dinner. YES. I also love that this butter gives me one more tool to make my meals taste decadent, while keeping them on the healthy side. Having trouble convincing your family to eat their veggies? Try topping them with a little of this lower sodium butter. It has that fab butter flavor, with a lower calorie count and less sodium too! 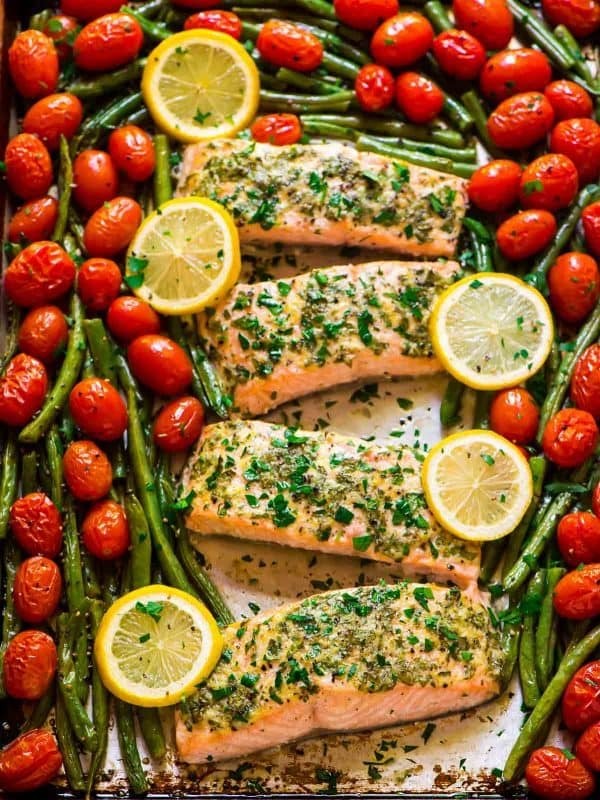 To turn this Garlic Salmon into an all-in-one dinner, I baked green beans and tomatoes on the same sheet pan, right beside the salmon fillets. This one-pan plan is ideal for weeknights…or any night you’d like to wash as few dishes as possible <—ahem, every night?? With busy bee fall approaching, complete with back to school for many families (and a spree of nonstop travel for yours truly), simple but special meals like this Garlic Salmon with Lemon Butter will be on repeat in our kitchen. Quick to prep and delicious to eat, this recipe shifts the focus away from the time we don’t have by allowing us to make the most of the time we do have. 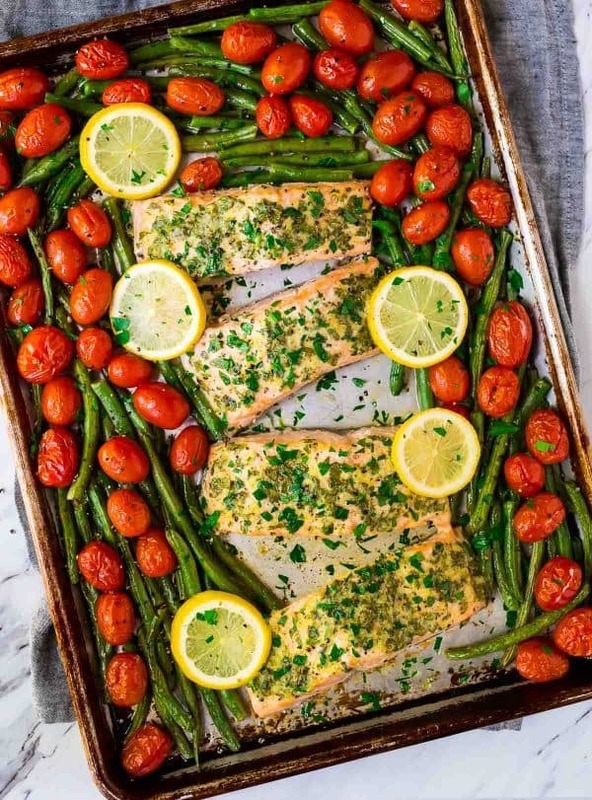 Easy Sheet Pan Baked Garlic Salmon with Lemon Butter and Veggies. Healthy, ready in 30 minutes, and everything cooks on ONE pan for easy clean up! Place a rack in the center of your oven and preheat the oven to 400 degrees F. Generously coat a large rimmed baking sheet with nonstick spray. Arrange the salmon fillets in the center of the sheet. 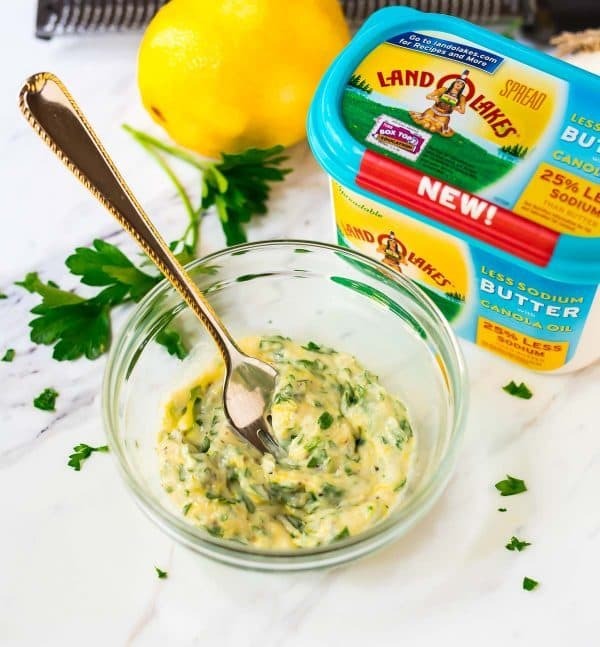 In a small bowl with a fork, combine the Land O Lakes Less Sodium Butter with Canola Oil, garlic, lemon zest, 2 tablespoons chopped fresh parsley, and 1/4 teaspoon black pepper. Mash to create a paste, then rub on the salmon fillets. If desired, arrange extra lemon slices on top. Place the green beans and tomatoes in a large bowl. Drizzle with olive oil and sprinkle with 1/2 teaspoon kosher salt and the remaining 1/4 teaspoon black pepper. Toss to coat, then arrange around the salmon. Drizzle the lemon juice over the top of the salmon and vegetables. Place the sheet pan in the oven and cook until the fish flakes easily with a fork and reaches an internal temperature of 145 degrees F, about 16 to 20 minutes. * Let rest 3 minutes. Sprinkle with remaining 2 tablespoons parsley, then serve, sprinkled with additional salt and/or pepper to taste. The cooking time will vary based upon the thickness of your salmon. Thicker (2-inch-plus) slices will need several extra minutes, while thinner slices may cook more quickly. My salmon fillets were a little more than 1 inch thick and cooked in 19 minutes. This recipe is best enjoyed the day that it is made, as salmon usually dries out when reheated. If you have leftover salmon, try serving it room temperature over a salad the next day or flaking and scrambling it with eggs. Extra veggies can be reheated and mixed into a salad or eggs, or enjoyed on their own. I cannot wait to try this, it looks amazing! I love how easy it is! I hope you love it, Rachel! Want to shake a desire for the weekend?? Have kids. HA! I kid. This looks totally amazing. Salmon is my absolute favorite, so I can’t wait to make this! LOVE all of the colors in this dish! Roasted cherry tomatoes are my favorite! This lemon butter also sounds so amazing! I cannot wait to give this a try! Thanks so much, Lexi! I hope you love it! This salmon is sooooo pretty Erin! Ran to the store for these ingredients the second I saw the recipe because I knew our family would love it. Tried it out and it’s SO GOOD! It takes minutes to prep and feels fresh and healthy. I was able to find the new butter too. My husband has to watch his sodium and cholesterol, so it’s perfect for us. Thanks! Elizabeth, YAY! I am so excited to hear this. Thank you so much for trying the recipe and letting me know how it came out for you. I’m also so glad you decided to give the Land O’Lakes Less Sodium Butter a go and that it’s helping your family. It really is a fantastic product! hey girl- this looks oh so amazing! yummy! Thanks Shawnna! I hope you love it if you decide to give it a try. Thanks, and I hope you love it! count down to dinner so I can make this is my motto! LOL! 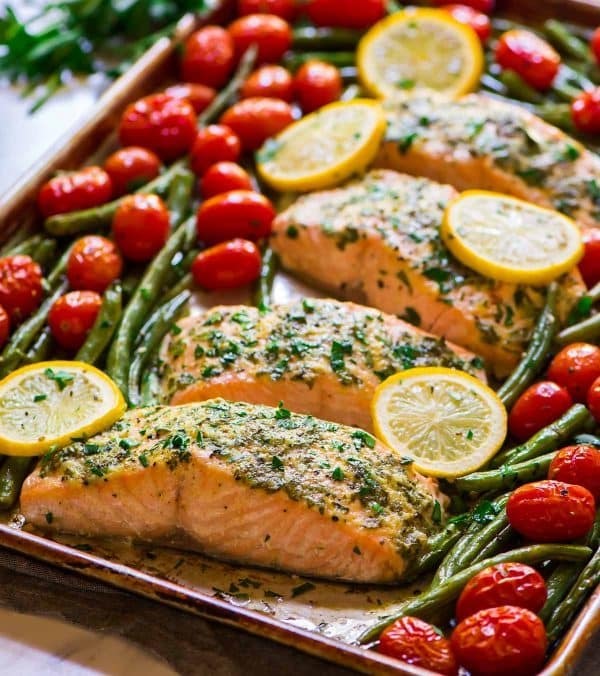 You can’t beat sheet pan salmon for dinner!! So agree Gerry. Thank you! Always, always, always need new salmon recipe ideas! Can’t wait to try this for dinner! I hope you love it, Taylor! YUM! This looks so flavorful! We loved this! My husband says it is restaurant quality. (Hey, maybe you should open a restaurant!) Thanks so much. I’m so glad to hear you enjoyed it, Melissa! Thanks so much for taking the time to leave this great review! This turned out great! The salmon is delicious and well flavored. I love oven roasted tomatoes so this dish may be on constant repeat :-). The only subs I made were to use salted butter (I had some leftover from another recipe I made) and asparagus for the green beans (also something I had readily available in the fridge). Thanks for the recipe! Ana, thank you so much for taking time to leave this lovely review! I’m thrilled you enjoyed it so much. This was so good! I also used real butter. Delicious! I’m so glad you enjoyed it, Jessica! Thanks so much for taking the time to leave this wonderful review! Thanks for taking the time to review the recipe, Kelsey! I’m so glad you enjoyed it! I added dill, cilantro, marjoram and ground mustard to my compound butter, paired with steamed broccoli and cauliflower and garlicky mashed potatoes loaded with fresh chives– its Saturday, I went for it. Your recipe inspired me! Neicey, YAY! I am so so happy to hear that you enjoyed it. Thanks for letting me know! I hope you enjoy, Zachary!